All states allow some type of no-fault divorce, where the court hears a divorce case without a determination of who is at fault for causing the divorce. Some states allow a fault-based divorce, where the court determines who is at fault for the termination of the marriage. In no-fault cases, the court refuses to hear issues of wrong-doing, such as adultery, mental cruelty or spousal abuse. However, in fault cases, a court considers these types of faults, and their negative impact on the marriage. If a spouse commits adultery and abandons his commitment to the marriage, the court can take these facts into consideration. Some states use a bifurcated divorce system, where they first resolve the dissolution of the marriage and later resolve property division and child custody issues at a separate hearing. All divorce cases start off as either contested or uncontested. They can also change from contested to uncontested during the divorce proceedings, if spouses fail to resolve pertinent issues in the divorce. An uncontested divorce means that both spouses agree to proceed with the divorce in a collaborative manner. In an uncontested divorce, couples often settle unresolved issues outside of court and submit a settlement agreement outlining their resolutions. 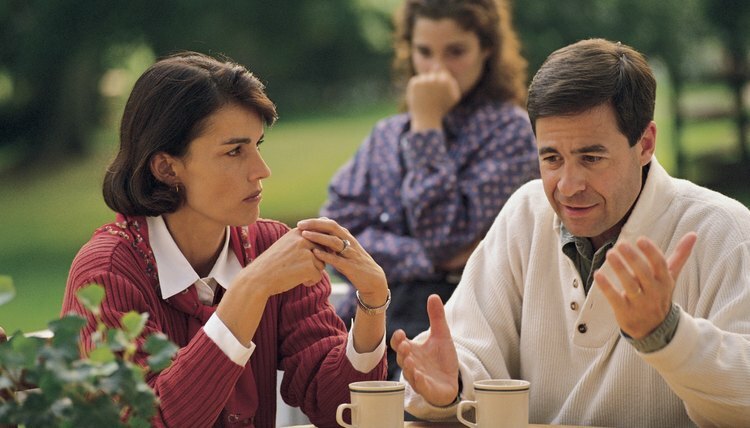 In a contested divorce, spouses disagree on the divorce. Spouses often disagree on fault, property division, child custody and spousal support. If these issues can be resolved in mediation, the case can move from a contested to an uncontested divorce case. Many states offer some form of a simplified divorce, also know as a summary dissolution. A simplified divorce refers to less complicated divorce cases that may be expedited through the court. These fast-tack type of divorce cases, often include shorter marriages, with limited assets, minimal outstanding debt, no children and no real property. Each state determines what type of marriage qualifies for a simplified divorce. Some states consider the length of the marriage, the amount of assets and whether the couple has any dependent children. Default cases refer to cases in which a party failed to appear before the court at a critical hearing on the divorce. The judge often orders a default judgment in the divorce, when one party shows up for the final hearing and the other party fails to show. If both parties fail to show, the court potentially takes the divorce off the court schedule without a ruling on the divorce. In default cases, the other party may have complied with some court rules and signed a settlement agreement, but failed to finalize the divorce. In a true default, the other party often fails to respond entirely and never submits any documents to the court. In extreme cases, a spouse can seek a divorce by publication, if a missing spouse can not even be found to receive the divorce papers. Both uncontested and simplified divorces often proceed as collaborative divorces, or mediated divorces, where both spouses work together to resolve all the issues in the divorce before they go to court. Some lawyers and their law firms specialize in collaborative divorces. These collaborative lawyers often use family law mediators and private judges to arbitrate divorces outside of court. Some couples elect to use a legal document service provider to complete their divorce paper work and represent themselves in a collaborative divorce. Courts often provide court mediators to help resolve child custody, visitation schedules, child support and spousal support details. Collaborative Divorce.Net: What Is a Collaborative Divorce? Legal Action Workshop: When You Are Served with a California Divorce, Don’t Run! What Would Hold Up an Uncontested Divorce?